I remember an editorial in the back of Hardware concerning the Death Wish storyline. I don’t know if it’s in the trade, but McDuffie elaborated on the story, and on believing if Curtis was going to change his attitude there needed to be a powerful situation. The story itself was uncomfortable for the creative team, and to read. The editorial also talked about how some heroes were in fact, murderers. It’s been a long while since I read that, but I never forgot about it, although some of the details were fuzzy. Hey Stacy. I wish I had a chance to read that editorial. I really admire McDuffie’s writing. He brings a lot to the table. 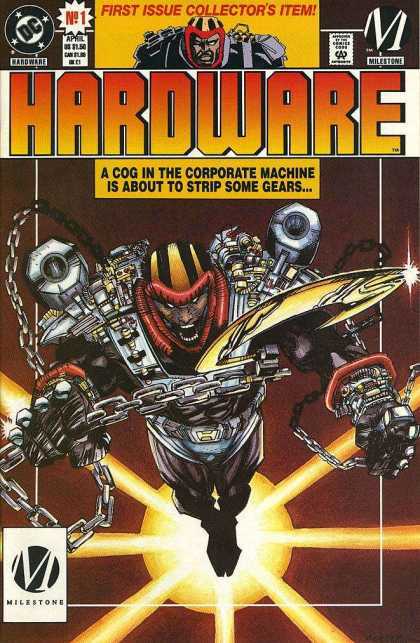 In many ways Hardware surpasses other contemporaneous attempts to satirise 90s superheroes, such as Morrison/Millar’s Aztek. Darn. I was hoping that this review meant I had missed DC putting this out as a trade. One good thing about DC buying the characters is that I got a Static Shock and an Icon trade out of it. Hopefully we’ll eventually get them as digital downloads in a drm-free version something in the next few decades. How’re ye Patrick, cheers for dropping by again. I hope I haven’t given you the wrong impression – I was reviewing a recently republished trade of McDuffie’s Hardware. To my knowledge there is only the one, but I am hoping to see more in the future. Also John Rozum’s Xombi is returning to the stands, with art by the excellent Frazer Irving. One to circle a date on the calendar for I suspect.